Camera system, precision package and multi-axis systems. This machine at the top of the ACSYS product range offers high performance and quality with a minimum footprint. 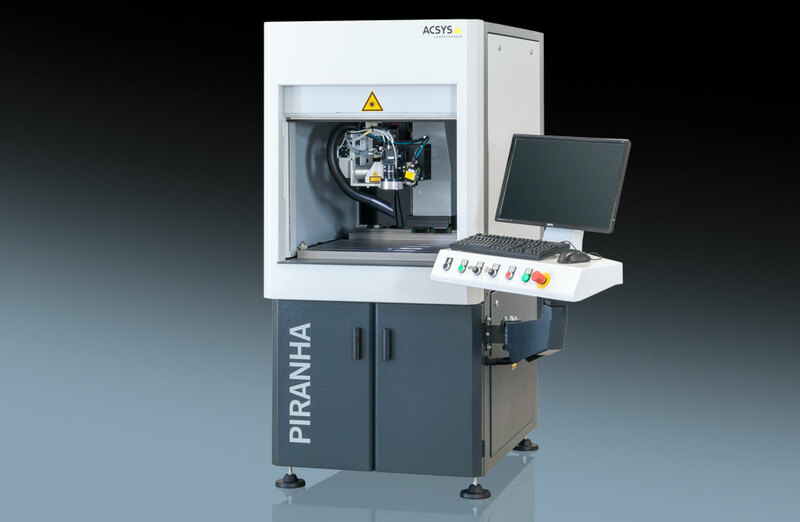 Fiber laser systems with exceptional beam quality make the PIRANHA a unique production machine for laser marking and engraving. For high-precision marking such as punch marks, fine engraving or 3D micro laser engraving, the system offers high-resolution camera systems, precision packages and a multi-axis system with up to five movable linear and rotary axes, consisting of linear moving columns or cross tables and rotary and swiveling dividing heads. With its rotary tables, tag feeders, foil handling or special attachments, the PIRANHA offers optimized adjustment options for any task. Perfect laser engraving by ACSYS. This laser system fulfill ACSYS’s promise to always go a step further and do what can technically be done in an inimitable manner. HUNGEXPO Budapest Fair Center, Hall A, Stand 105B. Challenge us! We work live on your samples! Wedesday, Thursday: 10 a.m. – 5 p.m.
Do you need more information or do you have any questions to the journey or to overnight accomodations? Call us, or write us.